By now most folks are wrapping up their year spending time with family and friends. However, for those still at work trying to spend that last bit of budget, these awesome furniture and seating specials are a great way to start. From affordable desking configurations to the latest mesh seating solutions, these end of year deals will help you save and improve your office decor. 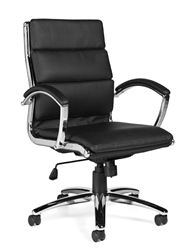 Looking for a hot new office chair to keep you comfortable and efficient in the workplace? 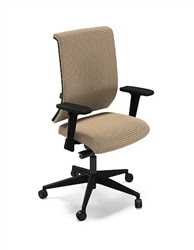 The Mayline Commute chair is the solution for you! This high quality mesh back chair offers some of the most up to date ergo features along with a stunning modern design that's sure to impress. Several models are available and a variety of upholstery options to meet your individual taste. Overall, this chair is a real winner! So that old desking configuration is no longer getting the job done. Not to worry, the price on this modern desk set by Cherryman Industries is sure to sway your superiors into picking up the tab with that last bit of of the 2012 budget. The VL-748 configuration is available with a left and right return. 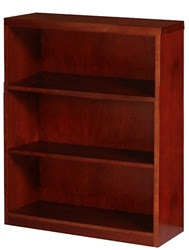 This stylish unit is available in two attractive finishes and includes free nationwide shipping. Enjoy! Ergonomic office accessories keep you working efficiently. They are a staple of the modern workplace and no product is more useful in active work environments than the dual screen monitor arm. Units like this popular model from ESI offer users the ability to create more usable desk space while effectively working with multiple documents or websites at the same time. Computer monitor arms offer an incredible amount of benefits and also provide a high tech look in the office. Every once in a awhile an executive desk configuration comes around that has a certain WOW factor. The new Mayline e5 furniture collection offers a wide variety of these units but perhaps none more than this custom modern office desk set with modern style. The luxury look and high end features of this easy to spec furniture solution make it a real winner in the workplace. 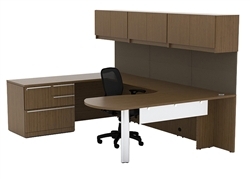 It's easy to picture this stunning Mayline furniture package in a high rise, contemporary business, or high tech workspace. Last but not least, this stylish glass drafting table by Studio Designs is a must see and must buy piece of home or business art furniture. The 10060 Avanta table features a tempered glass work surface, modern design, and excellent adjustment capabilities. 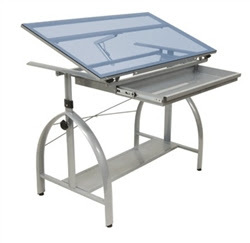 Artists, interior designers, and architects alike will love these affordable drafting tables. 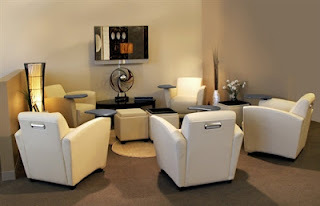 The use of professional lounge chairs in lobbies, reception, and waiting room spaces is growing in popularity daily. 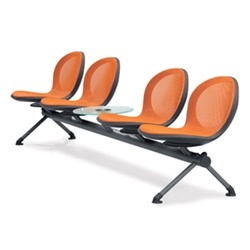 Less and less are companies opting for traditional gang seating solutions. Offering visitors a home like atmosphere promotes a welcoming environment that keeps them comfortable and happy. After all, first impressions of your business are typically formed from a visual perspective of the first place seen. This article highlights 5 stylish lounge chairs priced under $300. The solutions found here are sure to keep your space up to date and within budget! First on the list of chairs is this black leather barrel lounge chair. The unique barrel shape is where this product gets it's name. While this solution is available in a variety of colors, black was chosen as it's the most commonly used leather option in business. This affordable chair is priced at $169.99. The simplistic and contemporary features of this chair include slanted arms as well as a sculpted seat and back. Overall, an excellent value and perfect addition to nearly any visitor area. The Mystic lounge chair by Lesro Industries offers the perfect combination of functionality and style. The steel frame and modern shape of this awesome product make it a real winner. A versatile solution for any space, Mystic lounge and reception furniture from Lesro offers a variety of matching tables and seating solutions to compliment your chair of choice. 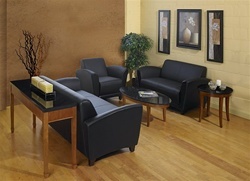 This model offers a budget friendly price tag of $190.99 and is available in a wide variety of upholstery options. Enough can not be said about the popularity of modern lounge chairs. 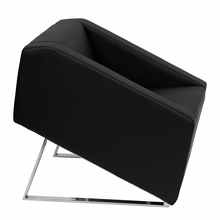 Solutions like this Uno Lounge Chair by OFM, Inc. are a big reason for the boom. This affordable product is available in a variety of two tone color options to meet the specific decor needs of any business environment. The 420 model boasts a stylish chrome frame and separated seat and back design to avoid collecting crumbs and debris often accumulated from younger guests. The flexible back, fire retardant seat foam, and round tube frame are all a bonus considering the everyday low price. When it comes to modern lounge furniture and seating, Flash Furniture products are widely considered the leader. This affordable office seating manufacturer offers an incredible collection of exclusive styles guaranteed to impress. The model features a stand out red leather upholstery that's sure to bring unique appeal to your upscale lounge area. Priced at $249.99, this contemporary solution features a taut seat and back along with modern silver legs that add to the commercial appeal. Last but not least, the Smart series chair. Unique in every way this square bucket style chair is a guaranteed way to make your space one of a kind. The originality of this chair is surprisingly refreshing and the comfort is simply unmatched. You will want to sit in this chair for hours! With a sell price of $259.99, it's hard not to love this contemporary office furniture solution. Inspiring furniture can be seen in a variety of places. Schools, modern buildings, museums, and health care facilities are among the top locations. The one space these places have in common is the lobby. 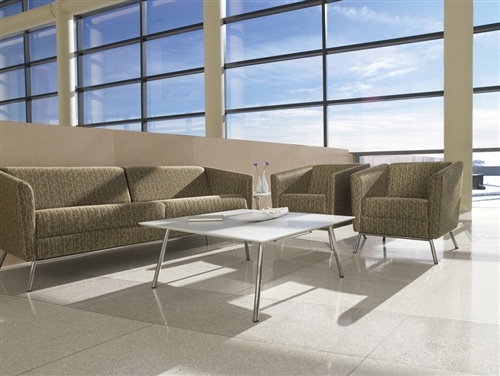 Lobby furniture and seating with style sets a professional tone for any facility. A well designed and inspired layout shows class and elegance. This article highlights a variety of stunning lobbies designed to impress visitors while boasting efficient and well thought our designs. The first lobby up features modern style that's hard to miss. This area incorporates a wide variety of modern accent furniture along with Mayline Santa Cruz tablet chair solutions in a stunning cream leather. As with most spaces, the lighting sets the tone! The beautiful standing lamp shown in the left corner catches the eye and effectively promotes the mood desired by the client. Overall this space gets an A+ on grade scale. Sticking with the modern theme, lobby two boasts a contemporary sofa and lounge seating from the Global Total Office Wind collection. This upholstered seating solution features metal legs that add to an industrial look popular in commercial lobby areas. The natural light and well thought out seating layout compliment each other perfectly. As an added touch, a matching Wind coffee table accompanies the room without over stating the simplicity of the atmosphere. The Mayline furniture offered in this configuration offers a warming feel that is quite welcoming. Spaces with a traditional style of this nature are often popular for those in search of a homey atmosphere. To compliment the space, wood floors, accent tables, and wall art was used perfectly. The added touch of a potted plant offers a lively characteristic that pulls the whole space together. The wall colors chosen are also a highlight. It's easy to see the time and care taken to provide guests with a comfortable and professional waiting environment. Lobby configuration 4 is designed to meet the needs of a business looking to accommodate a large amount of visitors. Utilizing an effective layout of gangable guest chairs, this client has effectively designed an efficient space with stunning style. The curved reception desk solution adds to the modern look while the reception area accent tables and area rug compliment the dark wood floors. Again we see the proper use of natural lighting which saves on power and adds to the welcoming feel. For those in search of versatility, OFM Uno seating solutions are the way to go. This modular furniture collection boasts a variety of contemporary sofas and tables designed for the ever change needs of modern businesses. 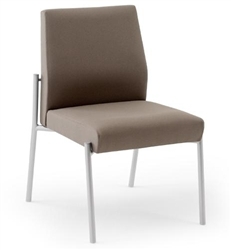 Uno seating is available in a variety of two tone color options that really draw in guests. Featuring this product in your lobby will get you an abundance of compliments for certain. Accompanying the reception seating is a variety of wedge table and magazine table models from the OFM Profile series. These well designed and incredibly modern office tables are also available in a variety of color options to meet the needs of your decor. The tile floors and welcoming table pictured behind the chairs complete the look. As a favorite amongst interior designers, this lobby setup is nothing short of amazing. The reception area is an important part of any business. This area typically gives visitors there first impression of your establishment and a professional look always helps. 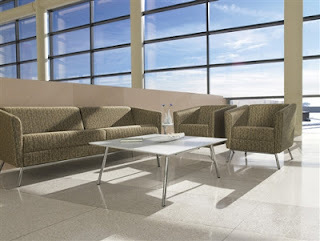 This article will highlight three simple steps that will have you're waiting area professionally designed with ease. By identifying the needs of your space, and finding quality products within budget, you to can be the office hero by creating an area to be proud of. With any furniture purchase the first step should always be to measure. Creating a detailed floor plan will minimize headaches down the road. That being said, the first step in creating your space should be locating affordable reception desks. The main piece of furniture in any waiting, reception, and lounge type are is the reception desk and that's why it should be first on your list. It sets the tone for your business atmosphere. Quality manufacturers like Mayline furniture, Cherryman Industries, and OFM, Inc. provide a host of viable solutions to meet the needs of any decor and space. 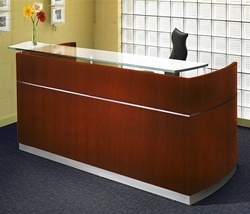 Popular styles include rectangular, L Shaped, and curved reception desk solutions. Once you've identified the a desk within the required dimensions of your space, with the style you love, add it to your cart and continue on to step two. Here are some popular solutions to consider when shopping for reception desks online. Step two in our journey to the perfect reception space is the seating. 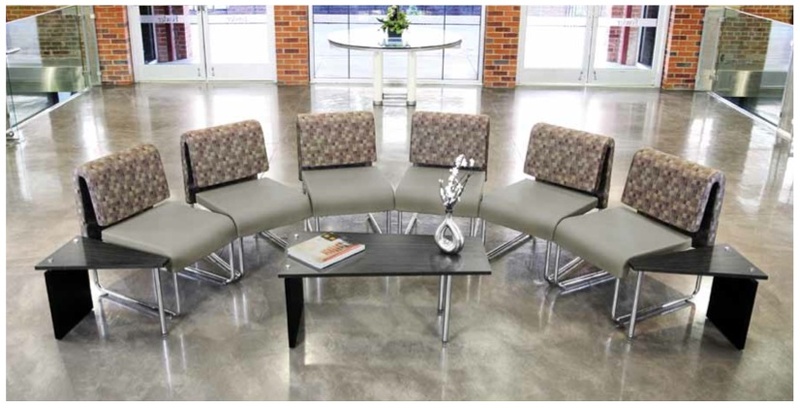 Identifying the style of reception seating to meet your needs requires a bit of research. The good news is, the research involves shopping so it's actually kind of fun! Several styles of seating are available for visitor areas. Modern products like beam seating are popular in upscale spaces with contemporary style. Lounge furniture like sofas, love seats, and recliners are commonly used in areas built to accompany less visitors and provide a more homey atmosphere. 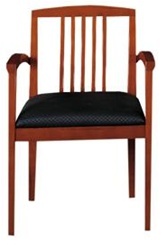 Wood guest chairs are a typical choice for law offices and areas with a distinguished presence. Regardless of your choice, shopping around is always recommended. Find seating that will compliment your chosen desk and most importantly fit within the dimensions of your space. Here are some commonly used reception seating styles. By accessorizing your reception space you will create an efficient and professional space that welcomes guests and keeps them comfortable. Products like reception tables provide the perfect place for your guests to set their drinks, laptop, magazine, and other items while waiting. They also promote the style of your space. 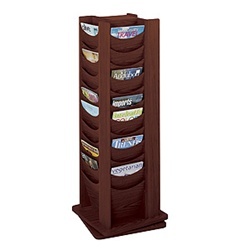 Items like magazine racks and literature organizers keep pamphlets well displayed and provide additional visual aids to your area. Utilizing lamps and plants is another great way to accessorize. Lamps will help to save on power when compared to large overhead fluorescents. Plants will bring your space to life and offer a vibrant, calming tone. Regardless of the accessories you choose, remembering the small details always makes the difference between a good space and a great one. Here are some popular reception area accessories to consider. Hopefully you have found these three simple steps of value. Creating a space to be proud of can be simple if you do your research, measure properly, and stay within budget. Working with an interior design team might be a solution to consider along with a professional office furniture distribution firm. Review products online to find the best quality. Request coupons or bulk discounts from reception furniture companies for added savings, and always give a quick phone call to your manufacturer of choice. You'll be surprised by the knowledge and awesome products suggestions they will be able to inspire you with. Most importantly have fun and enjoy the process! Furniture Trends: Glass Office Furniture is Hot! In today's world it's all about the cutting edge. When it comes to office furniture, three words best describe the trending style... modern, modern, modern! Everyone is in love with latest and greatest furniture collections for both home and business needs. That being said, the latest and greatest includes a variety of glass accented desking that really pops! Glass office products show class and style in the workplace and have grown in popularity over the last few years. Calico Designs caught this trend and just the right time. As a relative newcomer to the industry, Calico hit the ground running. Their innovative computer workstations have been a huge hit. One reason for the boom in popularity is the glass. Consumers love the modern look of Calico stations like the Jameson desk. 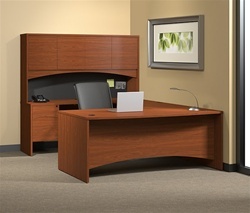 Configurations like the Jameson are perfect for both home and executive office applications. The tempered glass surfaces and corner friendly shape make them extremely versatile. The affordability of glass when compared to wood veneer furniture is often striking. 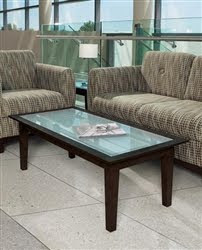 Glass can accented furniture can be significantly less expensive and therefore a better value. Units like the Jameson Workcenter are only $225.99! A favorite amongst industry professionals over the last 3 years, Cherryman Industries Verde furniture has been hard to keep in stock. This white glass accented casegoods collection includes a huge selection of modern conference tables, executive desks, and reception station configurations to meet the needs of any upscale business. This affordable laminate office furniture series is available in two coffee inspired finishes including latte and espresso. Verde desk set solutions like the VL-707N are designed for luxury office environments where budget and style are important. The white glass hutch doors, and shiny metal desk legs really provide a spark of interest by any visitor lucky enough to grace the space. Verde conference table models like the VL-741 feature glass leg panels and boat shaped surfaces. The contemporary style is hard to miss and for that reason, Verde is one of the best selling office lines in 2012. 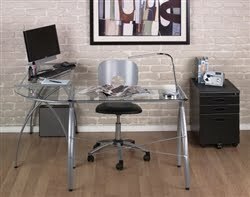 So you like glass accented furniture but still want to keep a traditional look in your workspace. No problem! Mayline furniture collections like the Aberdeen series feature subtle glass accents on hutch doors while maintaining a traditional appeal. The Mayline Napoli collection offers a nice blend of modern style with traditional charm. This collection of executive workstations offers a choice of three wood veneer finishes and a variety of small reception desks with glass transaction counters. Napoli is truly stunning and garners respect in any workspace. For the budget conscious, Mayline Brighton furniture is a line of laminate casegoods designed for professional businesses not interested in sacrificing quality. For that reason, Brighton appears to almost everyone! 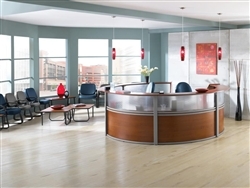 In the long run, glass office furniture is a style gaining momentum for years. It looks like this trend has no end in sight. Utilizing glass is an excellent way to make a professional statement while staying within the confines of even the strictest budget restraints. Collections like Verde and Napoli are perfect for the contemporary minded while Aberdeen and Jameson products work offer a nice combination of both traditional and modern decor needs. By working with a designer or professional furniture consultant, a well thought out and efficient workspace is never out of reach. In business a professional appearance can be costly. Several luxury office furniture lines are available that scream success but are not practical for small business owners looking to level the playing field. All things considered, a luxury executive work environment can still be achieved with a relatively low budget. The desk configurations in this article are excellent examples of budget friendly furniture solutions that will surely impress even the harshest critics. This stylish set is not from your typical casegoods collection. Verde executive solutions by Cherryman Industries is the perfect blend of modern style and affordability. The VL-743N desk package includes a beautiful contemporary table desk along with a wall storage and credenza configuration that creates a high end appearance at an everyday low price. This set is available in two coffee inspired finishes and also includes free delivery. 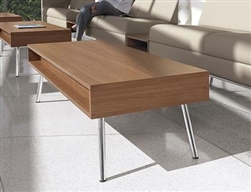 Mira series furniture is available in two popular finishes. This leading Mayline furniture collection offers a huge selection of matching conference tables, reception stations. 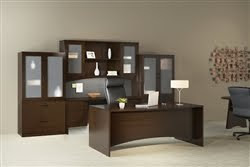 and more to complete your business furniture needs. Mira's wood veneer construction and high quality craftsmanship make it an excellent value. Often in used in home offices, Mira's traditional look warms offices with elegance and style. This popular corner desk set offers plenty of storage and usable workspace while fitting comfortably within the confines of smaller work areas. Global Total Office produces some of the absolute best furniture solutions available. As a respected provider of lounge, reception, and conference room furniture, it's no wonder why Zira desking by Global is rapidly growing buzz throughout the furniture scene. The number 7 layout is considered a modern U desk package. This set offers a seemingly limitless selection of customizable features including a choice of laminate finish and drawer pulls. This incredible collection cannot be limited to one desking configuration. The OFM Milano desk collection offers to wide a selection of versatile components to for that designation! For the sake of this article we will focus on the 55501 Milano desk. This modern office solution is available in two popular finishes with the added style of metal accented legs. The 55501 is easily assembled with no tools and is typically in stock. This $699.99 desk works well in any workspace and is available with tons of matching furniture that can be added later.... an excellent feature for those on a strict budget! Configuration 5: Brighton BT4 Typical. Many have reviewed, utilized, and experienced Mayline Brighton Furniture over the past few years, and for good reason. This incredible furniture line is the absolute best value on the market. The BT4 typical is available now in your choice of two finishes for only $1109.99. 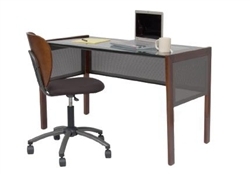 This U desk set offers ample overhead storage and modern style to meet your needs. 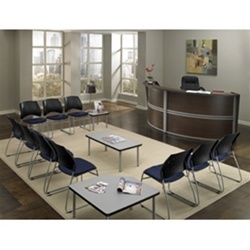 Brighton products are typically in stock for quick shipment and include a variety of additional filing, conference, and reception furniture solutions that are definitely worth a look. 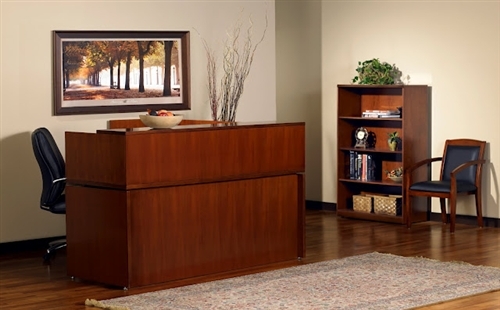 Whether you're in need of home furniture or executive business desks, Brighton has your every need in mind. We all know there are is a virtually unlimited selection of office chairs available today. All chairs claim to be ergonomic, adjustable, multi functional, and a host of other adjectives to keep you interested. However, there are 5 particular chairs out there that won't break your budget, offer excellent features, and are pretty darn cool. Enjoy this list of the 5 hottest office chairs for the home and business. The C1BB Commute office chair from Mayline had to make this list! This new modern mesh chair is revolutionizing the seating industry. A simple to spec solution for today's office environment, the Mayline Commute chair fits users from small to tall by leveraging the seat slider. 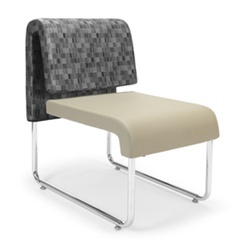 The new Commute chair is available in both mesh back and upholstered back styles with a choice of black or chrome base. 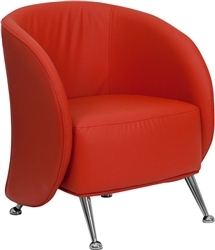 This modern swivel chair is priced from $311.99 and up. An excellent value any way you slice it and definitely one of the coolest desk chairs available. When it comes to modern style, the new G20 desk chair by Global Total Office has to be mentioned. This ergonomic features and efficiency improving features of this modern office chair make it one of the coolest seating solutions for both home and business use. 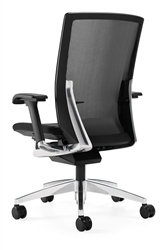 The 6007 model G20 chair is intended to bring harmony between form and function. With attributes like cast aluminum accents, synchronized seat mechanism, fully active lumbar support, and a durable yet breathable mesh back, it's no wonder why this new swivel chair is selling like hot cakes. Next up, the Global Metrus chair. Okay, so this chair has been on the market for awhile. That doesn't mean it's not one of the best! The 4518-3 Metrus chair by Global Total Office features a contemporary style that's hard to miss. The adjustable height arms, foreward and reward seat tilt with infinite tilt lock, pneumatic seat height adjustment and tilt tension control are just a few of the features of this awesome chair. This model comes standard with polished aluminum base and is available in hundreds of upholstery options including leather for your executive seating needs. 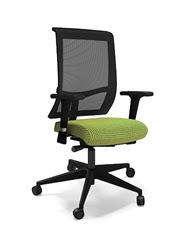 It's hard to say what's cooler with 11648B chair by Offices To Go, the $214.99 price or the style! 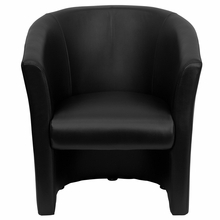 This segmented cushion executive chair boasts a luxhide leather upholstery and polished frame. In person this chair really has an impressive "WOW" factor. The swivel/tilt mechanism with tilt tension adjustment, pneumatic seat height adjustment, and twin wheel carpet casters add to the value of these modern desk chairs. Offices To Go chairs are manufactured by Global Total Office and typically ship within 48 hours. High quality, affordable, and stylish, now that's impressive! Last but not least, the RFM model 22011 Verte chair. Imagine settling into a chair that molds itself to your spine’s unique shape. Inspired by the human vertebrae, the Verte combines ergonomics, form and function to produce the ultimate in seating posture and comfort. A decade in the making, the Verte was created by a team of engineers, designers, and ergonomists, and is truly one of a kind. Sit in it once, and you’ll never settle for anything less. Hopefully you have enjoyed this list of modern office chairs for the home and business. While there are hundreds of additional models available from these manufacturers and many others, it's always important to find out what chair works best for your individual needs. Test a variety of task chairs, swivel chairs, and ergonomic desk chairs to find out what fits your body type. You might end up surprising yourself! No matter what chair you decide on, remember this simple fact, making cool and comfortable work together is definitely attainable. Throughout the holiday season furniture sales are widely available online. Knowing where to shop and what products are the best deals is essential. Stop buying ties and cologne for dad. Enough pajamas for mom. Let's be honest, kids don't really like opening clothes. Get your loved one something they can really use! These holiday gift ideas are real winners and a perfect solution to your gift giving crisis. This 48" glass computer desk by Calico Designs is the perfect gift for any young professional. The modern style and wood accents warm up any space and are sure to get a plethora of compliments. The 56000 office desk features hardwood legs, a tempered glass surface, and floor levelers for stability. For only $299.99 this unique Christmas gift can be yours. Looking for the wow factor? Replace that old table while the wife is asleep, and let her wake up to this beautiful new piece of modern furniture in the living room. The Dawson 3376-G table by Global features elegant lines and is available in several rich finishes to match the decor of any space. It won't take long for her to notice this! She will compliment your taste and love you're creativity. Using a single computer monitor in the workplace is a thing of the past. They are almost as old school as those briefcase phones you'd where over your shoulder. 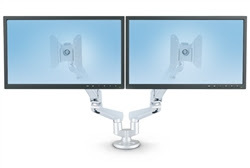 Dual screen monitor mounts offer the ability to create usable workspace and a far more efficient work environment. Monitor mounts adjust to meet the needs of the user effortlessly. They are truly an essential part of any ergonomic office. By now you've probably seen this awesome piece of office equipment at your place of business. It's time to upgrade your home workspace for the family and this modern gift idea is the perfect place to start. We can all use more storage. Space in any office is a premium and what better way to maximize it than with this stunning Mira series bookcase by Mayline. 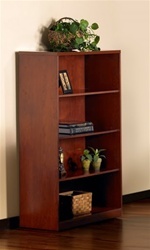 Available in two finishes, the MBC3642 model bookcase is the perfect gift for any executive. Mayline Mira furniture is designed for luxury work environments and truly stands out. 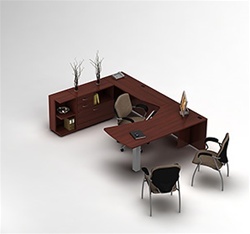 This collection of business office furniture also includes a variety of tables and executive desks to match.